Black holes and gravitational waves are among the most fascinating predictions of Einstein’s theory of gravity. Black holes are ubiquitous: they are responsible for many X-ray sources in the Milky way, quasars are believed to be powered by their immense gravity and there is indirect evidence that every galaxy hosts a massive black hole at its core. The evidence is indirect because astronomical black holes don’t emit any electromagnetic radiation and hence the name black. However, Einstein’s theory tells us that they must emit gravitational radiation. The first evidence that gravitational waves exist came from observations of double and single pulsar binary systems. It was found that their orbits were decaying in precise agreement with general relativity. The most famous pulsar binary system being the Hulse-Taylor binary. On at 9:51 GMT on 14th September 2015 everything changed. 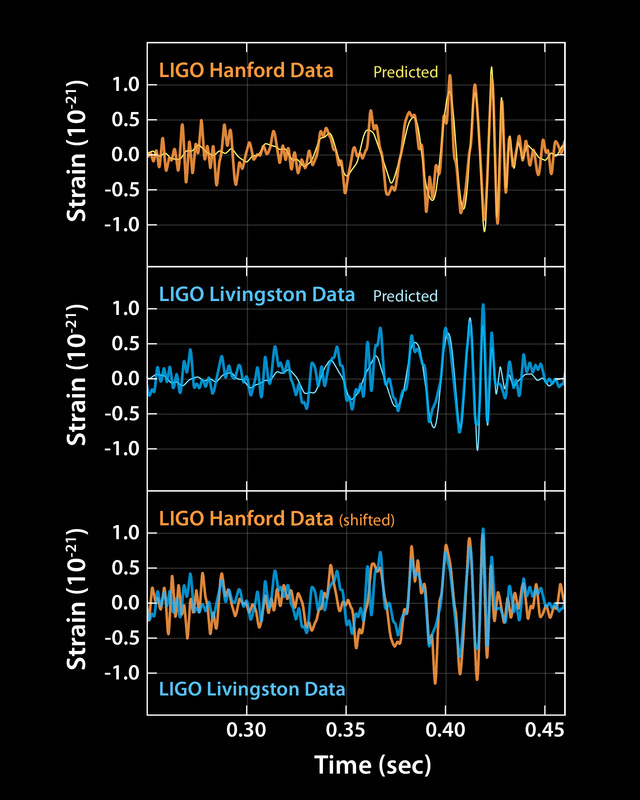 The two LIGO detectors picked up the first ever direct signature of gravitational waves from the final stages of two black holes merging together. Nobel Laurette Subramanyam Chandrasekhar in his book Mathematical Theory of Black Holes says "… black holes of nature are the most perfect macroscopic objects that are in the universe: the only elements in their construction are our concepts of space and time". They are also the simplest macroscopic objects because according to Einstein’s gravity astronomical black holes should be charcterised by only two numbers, their mass and spin. In this respect, black holes are similar to elementary particles like electrons, protons, and neutrons, which are also characterised by very few numbers, their mass, spin, and electric charge. Although black holes could, in principle, also have electric charge, because matter on large scales tends to be electrically neutral, we don’t expect astrophysical black holes to be electrically charged. The image above shows an artist’s impression of a massive black hole, believed to exist at the heart of galaxies throughout the Universe. As black holes emit no light, traditional astronomy cannot directly detect them, what astronomers from Earth have detected is the accretion disk, that is matter swirling into the black hole often glowing in X-ray energy, and beams of charged particles moving away from the black hole at speeds close to that of light. Stars that are only as massive as Sun end up their lives as white dwarfs, where the electron degeneracy pressure, a quantum mechanical effect, holds the star from imploding. White dwarfs that are about 1.4 times more massive than Sun (called Chandrasekhar limit) cannot be supported by electron degeneracy pressure; they collapse to form neutron stars, where neutron degeneracy pressure holds the star from imploding. In fact, pulsars are nothing but rapidly rotating neutron stars emitting beamed radio waves along their polar axis. Due to the rotation of the star we see the radio emission as a pulse each time the beam sweeps across the Earth. What happens to a neutron star if its mass is slowly increased? No one knows the answer to this question nor does one know how massive a neutron star could be before it begins to collapse again. Most physicists suspect that degeneracy pressure cannot hold a neutron star beyond about 2 to 3 solar masses. Stars larger than that could end up being entirely made of quarks or some other exotic matter. The ultimate fate of an object that is more massive than about 3 solar mass is to implode upon itself and collapse to a point. Because gravity at the point of collapse is infinitely strong it is called a singularity. Stellar mass black holes could well be the end state of stars that are far more massive than Sun. However, no one knows how and when massive black holes at galactic cores formed. British mathematician Roger Penrose has conjectured that nature forbids us from directly experiencing the immense force of gravity created when a star collapses to a singularity. It does so, he says, by shrouding the singularity in what is called an event horizon. Event horizon is the boundary of the region around the singularity from which nothing can escape, not even light. The shape of the horizon is spherical if the black hole has no spin. If the black hole has spin then, just like any spinning object, the horizon flattens at the poles, but the horizon will still be axisymmetric (that is symmetric shape about its spin axis). It turns out that there is not much sense in talking about the distance of the horizon from its centre as space and time get strongly warped inside a black hole’s horizon. However, one can still talk about the area of the horizon. For a stellar mass black hole of, say, 5 solar masses the area would be that of a typical large European city. Black holes ain’t really black! It has long been known that black holes are pretty robust with respect to their shape and when deformed from their quiescent state they get back to their original shape by emitting gravitational radiation, often called a ring-down radiation or quasi-normal mode. If ring-down radiation is converted to audio, it would very much sound like the dying tones of a bell. The energy for ring-down modes comes from the energy put into deforming the black hole but the frequency and the damping time of the waves depend only on the black hole’s mass and spin. Black holes also emit gravitational radiation if they are accelerating, for example in an orbit around another body. We do not know if black holes exist in binaries and if binary black holes exist; gravitational wave observations should reveal this in the near future. In fact any accelerating mass will emit gravitational waves in much the same way as an accelerating charged particle emits electromagnetic radiation. Even as you move your hand and mouse to read this web page your movements emit very weak gravitational waves. These gravitational waves are similar to light and radio waves in many respects and carry energy from their sources. Radio waves are easy to detect and observe and our radio and TV antennas do this all the time. The reason they are able to do this is because radio waves interact very strongly with charged particles, namely free electrons in the antenna. Unlike radio waves, gravitational waves interact with all forms of matter – both charged and neutral – but their interaction is far weaker than radio waves. 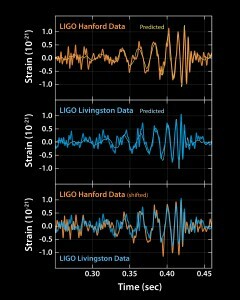 A world wide effort is now on to detect gravitational waves; black holes could well be the first to show up in this new window of observation called Gravitational Astronomy. What happens to neutron stars as their mass is slowly increased? Do they collapse first to a quark star or do they directly form black holes? What is the maximum mass of a neutron star before this could happen? What is the ultimate fate of all matter? Are there naked singularities that are not covered by horizons? Are black holes really characterised by only a few numbers? These some of the fundamental questions to which gravitational wave observations could provide the clue.